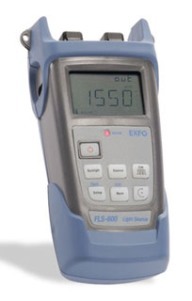 Part of EXFOs 600 handheld series, the FLS-600 Light Source is designed for first-class versatility. Choose between laser or LED models, as well as various wavelength options. What's more, you can save time by building a list of your favourite wavelengths and only sweeping through these wavelengths when testing. Using the FLS-600 in Auto-Switching mode allows you to automatically toggle between available wavelengths. When using this source with a compatible power meter (FPM-600 and FOT-600), the latter recognizes the wavelength in use and switches to the proper calibration parameters.